Successfully Added Chuwi Hi10 Ultrabook Tablet PC - Licensed Windows 10 + Android 5.1, 64Bit CPU, 4GB RAM, 64GB Storage, HDMI, Gen8 Graphics, USB to your Shopping Cart. With a 10 inch IPS display, the bright screen and picture perfect 1920x1200 resolution this CHUWI Hi10 will take your tablet experience to the next level, bringing quality video viewing gaming and productivity in one stylish sleek package. Equipped with an Intel Atom 64 bit processor, 4GB of DDR3 RAM and Intel HD graphics its more than a match for anything you throw at it and is ultra fast for surfing the web, playing 3D games or endless multitasking. Whether it's for study, work or play the CHUWI Hi10 brings enough power to meet all your needs. You can go big with the mini HDMI output allowing you to create a home theater by plugging in to a large screen TV or projector and share the fun. A massive 64GB of fast eMMC memory brings a stable storage space for accessing your files and media without delay. Extra storage comes with the micro SD card slot so you can double your storage and keep everything that's valuable on this one splendid device. The Windows 10 operating system on this Tablet PC is fully licensed there's no update fees or hidden licensing costs. You can enjoy the limitless expanse of Windows supported software and games for a world of productivity, fun and entertainment at your fingertips. With a Android 5.1 as well you can enjoy the best of both worlds and get apps galore to enhance every day. 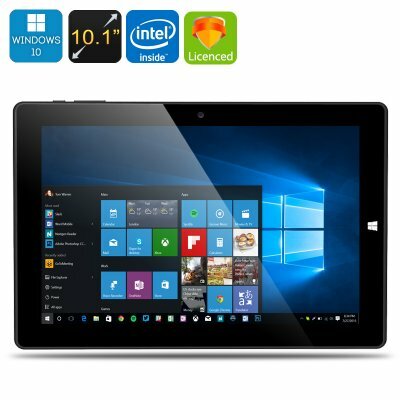 Powered by a built in 6600mAh battery this tablet has enough life to see you through day whether it relaxing with a film, running off some work or surfing the web you'll enjoy it all in great quality on this Windows 10 CHUWI Hi10 tablet PC. The CHUWI Hi10 Windows 10 tablet PC comes with a 12 months warranty. brought to you by the leader in electronic devices as well as wholesale Tablet PCs..